Live Three Card Poker has been developed by Evolution Gaming under an exclusive licensing deal with Scientific Gaming. It’s one of the most popular table games in American and UK land based casinos, and now you can play online at any Evolution Live Casino. I just love the game. I play it every time I visit a land based casino. It can bite your arse or pay you out beautifully. What I love is being able to do a slow reveal on the cards, a bit like the Squeeze you get when playing Baccarat. Peeling back the edge of the cards to see the colour, suit and numbers can be a real thrill, especially if you see the same colour. Perhaps you’ve got a flush or even a Straight Flush! Unfortunately, due to licensing restrictions only USA players based in New Jersey are able to play 3 card poker online. I’m currently playing at Grosvenor (UK Players Only), Genting and William Hill Live Casinos. Grosvenor and Genting have their own dedicated tables, so are able to offer extra promotions and prizes while you’re playing. Grosvenor also has a live host in the studio who will even credit your account if you’re on a losing streak. You have to ask nicely though :-). Stakes from 1 – 300. Stakes from 1 – 10k. Live Three Card Poker shouldn’t be confused with Live Casino Holdem. They are both derived from poker, but three card poker is played with just three cards whereas Casino Hold’em is played with a 5 card hand. In Three Card poker the dealer and players both get dealt 3 cards. The better-ranked poker hand wins. In Casino Hold’em 5 community cards are dealt alongside two cards for the player & dealer. Each will make up the best 5 card poker hand they can. The better poker hand wins. In both of the games, the player hand has to beat the dealer to win. Are there any Differences between Land Based and Online Live 3 card Poker? At a Land Based Table up to 7 player positions will be dealt to, whereas in the online version of 3 card poker only one player hand is dealt. This difference is purely a numbers thing. It’s easier for the online provider to present the game in this way as multiple players (and I mean 100’s), can play the hand at the same time. In a land based casino this is not possible. Could you imagine the queue at the table! It’s also more cost effective as the online provider only needs one table and one dealer. In Land Based 3 card poker you get Prime (pays if your cards are all the same colour) and Progressive Jackpots and Pair and 6 Card Bonus. Online side bets are restricted to Pairs and the 6 Card Bonus. At the time of writing this, three card poker is only available at Evolution Casinos. The table below summarises where you can play, which casinos have dedicated tables and the stakes you can play for. There’s also details of the optimal playing strategy if you like to have a game plan when playing. Keep an eye on my live casino reviews as they are updated regularly with casinos that offer three card poker. 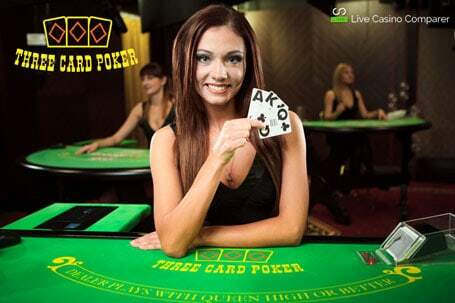 The object of live three card poker is for the players 3 cards to beat the dealers three cards. One pack of 52 playing cards is used and in live three card poker a new deck is used after each hand. Cards are ranked in descending order, with the Ace (being high or low), followed by King, Queen, Jack, 10, 9, 8, 7, 6, 5, 4, 3, & 2. Prior to cards being dealt the player places a bet on the PLAY position on the table. An optional side bet (Pairs plus) can also be made at this time (I’ll explain more about this in a minute). Three cards are then dealt to the player face up and three cards are dealt face down to the dealer. The player then decides whether to fold or play his hand. If he selects to play then he must place an Ante bet equal to his play bet. The dealer then reveals his cards. The best hand wins. The dealers hand must qualify with a queen or higher to be able to play. If the Dealer does not qualify then the Play Bet is returned to the player and the Ante bet is paid at even money 1:1. When the dealers hand qualifies and the players hand is better, the Play and Ante bets are paid at even money, 1:1. If the dealers hand is better, then the player loses both bets. If the dealer and players hands are the same then a push results and both bets are returned to the player. In the event that the player is dealt three of a kind, a straight or straight flush a Ante bonus is paid even if the dealer wins the round. This is a optional side bet that can be placed when the player places his play bet. You win the bet with a pair or better even if the players decides to fold his hand. This is another side bet that you can place. Your 3 cards and the dealers 3 cards are put together and if they make a 5 card poker hand of 3 of a kind or up you get paid at the odds listed in the table below. The theoretical return for this bet is 91.44%. It’s universally known that you should play your hand if it’s made up of a Queen, Six & Four or better. I know it feels like you should fold but statistically this is a strong hand. In terms of return to player the odds are not as good as Live Blackjack. The RTP for 3 live 3 card poker is a bit low at 96.63% and 95.51% for the Pair Plus bet, especially when you compare it against other table games like Blackjack at 99.5% and Casino Hold’em at 97.84% for the Ante Bet. However the lower RTP is no reason not to play. I think the game has been designed for the true gambler! If you’re looking for somewhere to play then have a look at my Best Live Three Card Poker Casinos page, which gives information on the best places to play.